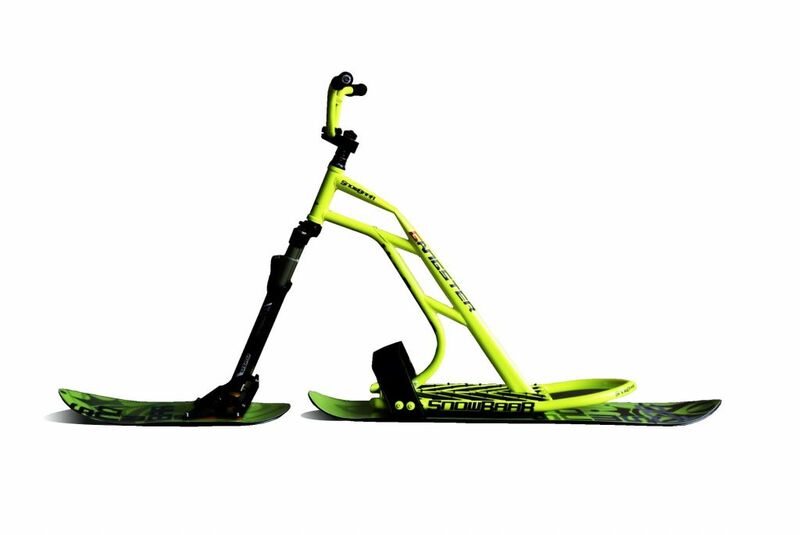 The unique shape of the skis with carbon fibre stringers, robust suspension fork and original design are the main attributes of the SnowBaaR Gangster. As the name itself suggests, the "GANGSTER" series likes to be challenged in even the roughest conditions. 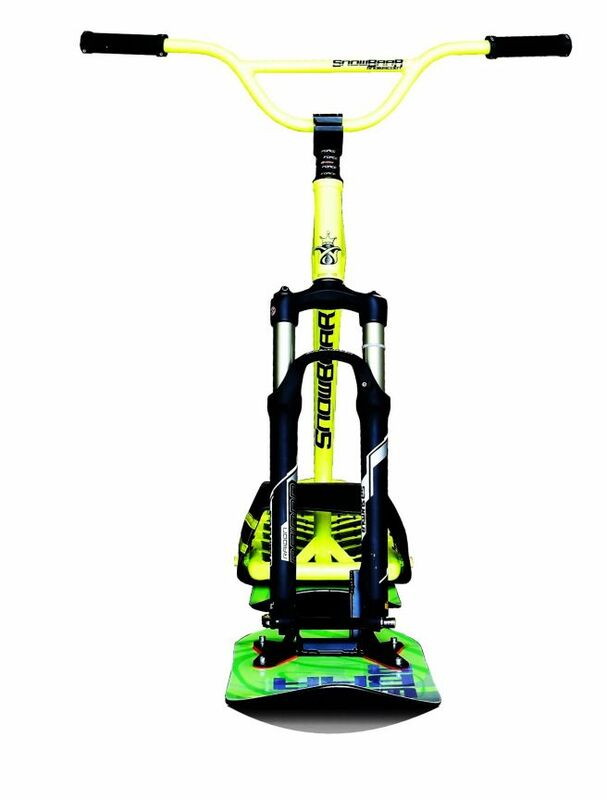 Its main advantage is, without a doubt, the suspension fork, which provides the snowscoot with new possibilities. An air and oil chamber is used to ensure that the springing and damping characteristics of the suspension fork do not change in cold temperatures. The firmness of the fork is taken care of via an air spring combined with 32mm stanchions. The oil damper allows you to tune the speed of the rebound. The carrier is attached to the fork using a 15mm through axle. As the frame follows the Free-ride concept, the head angle is set at 69°. The shorter head tube, which had to be used for the snowscoot with a suspension fork, is supported with a frame featuring two centre tubes. Four stringers ensure the ideal frame stiffness, two of which are parallel and connect the top frame tube with the bottom support part and two are opposite each other, which eliminates the twisting of the frame to the sides. Maximum comfort is guaranteed by 30 adjustable pins (0 - 12 mm) that keep the boots firmly in place in all situations. The skis for this model have been completely modified, both the internal structure and also their overall shape. Sidewall construction has been used for the sides of the skis. The wood core is reinforced with carbon fibres at both ends. 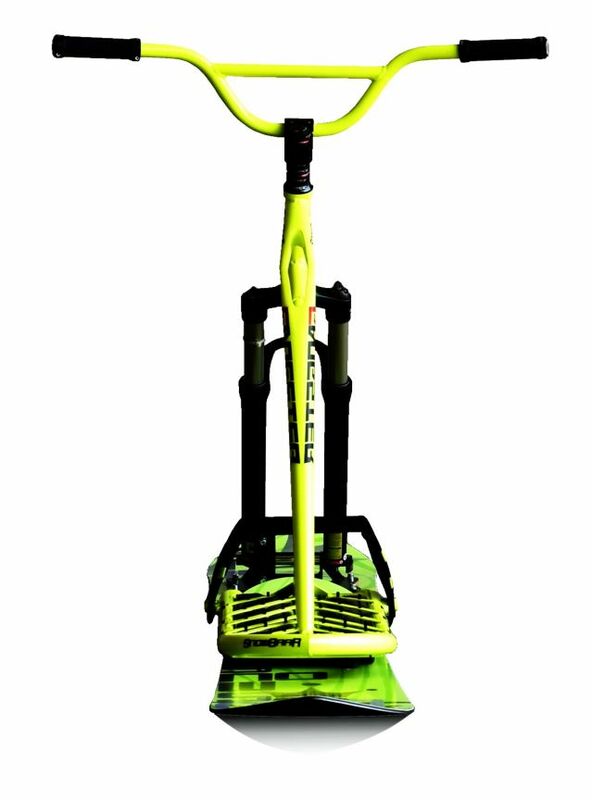 The new unique shape of the skis, with their tips 30 mm higher than ordinary skis, prevents excessive "sinking" of the snowscoot into fresh snow, drifting smoothly even in deep snow. The Gangster model can be finished in a colour of the customer's choice and it is possible to choose from a whole range of colours that can be found on our website.